A baby is coming as cute as can be.. will it be HE or will it be SHE?? Expecting couples are bringing back the magic and excitement with a soar in the new trend of gender reveal parties. Rather than finding out the gender of your baby at the ultrasound or via a blood test results couples are opting make it an event they can share with family and friends. Recently we were approached by Jane and Anthony to make a custom designed gender reveal cake. 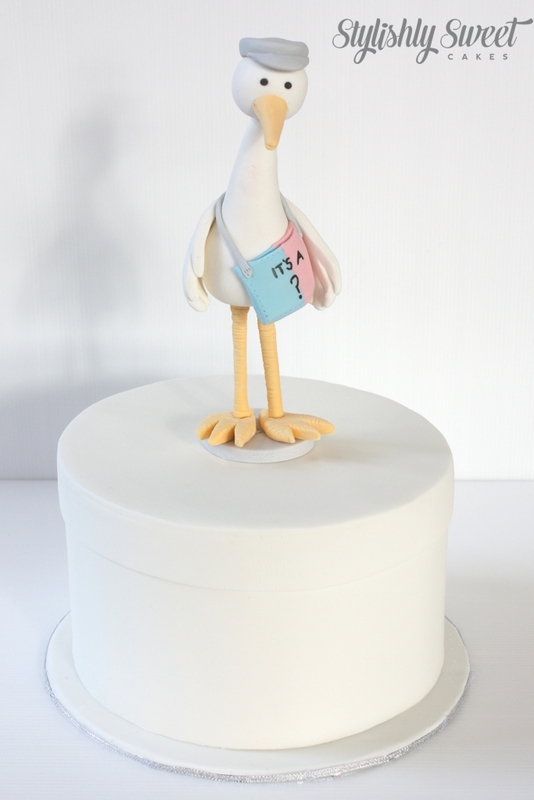 Jane wanted a simple white box style cake with a stork carrying a pink and blue bag with big question mark. Inside the cake pink or blue would reveal the gender of their child. A handwritten note from the ultrasound clinic arrived in the post and we set out to make this gorgeous couple their very own gender reveal cake. Yep its a girl! Congratulations !! if you’d like the stork from Stylishly Sweet to deliver your good news via a gender reveal cake just drop us a line or call.